My first flight on the huge A-380, the biggest airliner in the world. 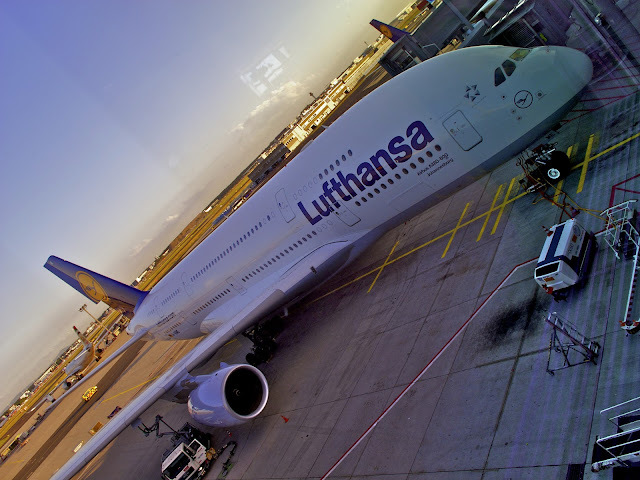 It's Lufthansa this time, they had a special deal that was impossible to turn down. OK could hardly be clearer than that. Singapore had a long history of opium smoking, dating back to the XIX century when the British actually encouraged it. Opium sapped the energy of society and memories last a long time in Chinese culture, so it is not surprising that there is such a determination to stamp it out today. Of course I keep reading that drugs are readily available in Singapore, so I am not sure about just how strong a deterrent the death penalty really is in Singapore. 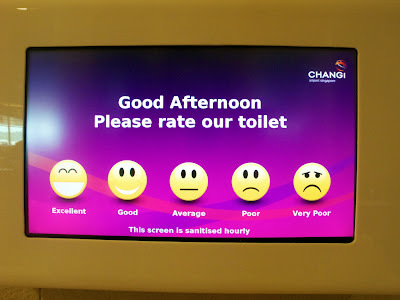 Changi Airport, I gave it an "excellent"
At the airport (one of the best in the world, though I prefer Hong Kong's) Luca and I are welcomed by a plethora of shops, restaurants and super clean toilets, in which the management takes great pride. By the time we are processed through customs our luggage is waiting for us on the carousels and we are off to a twenty-minute taxi ride to the hotel. The road is lined by gardens full of flowers, trees, lawns, and not one advertisement board. With very few exceptions, these are banned in Singapore, which is rather funny as this is one of the biggest shopping capitals of the world. In the evening Luca and I join a couple of friends for a seafood dinner at the one of the many restaurants along the famed Singapore East Coast. I want to try shark fin soup. Being a conscientious diver I am absolutely against the horrible slaughter of sharks that is perpetrated each year to privide for this fare, but let me try once. It is really nothing special, I can't understand what's the big deal about it, and I won't ever have it again.